When I began my training program in spiritual direction almost six years ago, we were asked to bring in some creative something or another...I can't remember the given prompt and I don't remember what I brought. But I do remember that my friend Patsy brought to our small group the most wonderful collage...most of the images were cut from magazines ("O! is the best!" she said) and they were glued to simple drugstore poster board...but Patsy's collage was so beautiful it was worthy of hanging in a gallery. I was in awe. Patsy shared with our small group that creating collage pieces had become an important spiritual practice for her, one that she engaged in regularly. After creating a collage, Patsy would "be" with her creation. She'd take it with her to spiritual direction sessions. For Patsy, collage was prayer...meditation...a way to discern...a way to understand the relationship between herself and the Divine. One Sunday morning Patsy packed up her car with boxes of magazines, poster board, scissors and glue sticks. We, along with another friend, met up at Patsy's church and spent the day together, cutting and pasting. "Always write the date on the back of your collage", Patsy instructed, "and give it a name." We had a wonderful time together and we vowed to collage together again, soon. Not too longer after that Patsy discovered she was ill and in what seemed like an unbearably short period of time, Patsy died. I wonder what happened to her collage pieces. I know she kept them. I hope the friends that cared for her in her final days kept them. It took some time, but I finally amassed enough magazines and catalogs and old calendars to invite others to collage with me. As often as I can, I incorporate a collage experience into retreats I lead or groups I facilitate. I remain in amazement of what can be uncovered. For the last two years, my Wednesday night group at Central Christian Church, Cultivating Mindfulness, has used collage to uncover a "word of the year"...something to pay attention in the coming months. This years word for me is LIVE. I have no idea exactly what that means for me. The word itself is rather unimportant. It's the invitation to go deeper that matters. Patsy taught me that about collage. It's never really about what is on the surface...there is always an invitation to look beneath. Just a few weeks ago I was invited by another retreat leader to engage in a mandala collage...I always eagerly anticipate a collage experience, inevitably followed by some pretty intense anxiety over what it will "look like" and eventually I settle in to what matters most...simply paying attention to the images and words that catch my attention. I had never used a round format before and my internal reaction to that was interesting in and of itself! One noticing: working with a page from an affirmation calendar that said "I deserve to live a happy and fulfilled life" WANTED to be included but didn't seem to fit quite right. Eventually I realized it wanted to be trimmed to read, "I deserve to live." I'm still sitting with what that means, exactly. I am pleased that in 2016 I will offer a series of mini-retreats, in collaboration with Liz and Connie, proprietors of the Blue Heron B&B and Retreat Center. 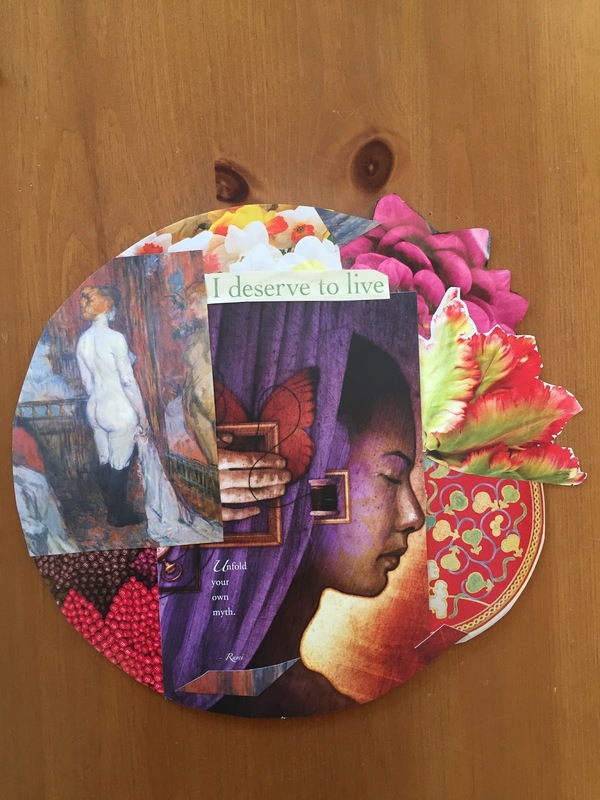 The April retreat will feature collage as a meditative and spiritual practice. If opening yourself to the process of collage interests you, perhaps you might join us. Oftentimes we can learn a lot about ourselves when we "turn off" our thinking mind and "tune in" to the heart. One way we can help ourselves do this is to experience meditation in an unexpected or new way. Join us for a day of fun and color, as we open ourselves to the insight of collage. 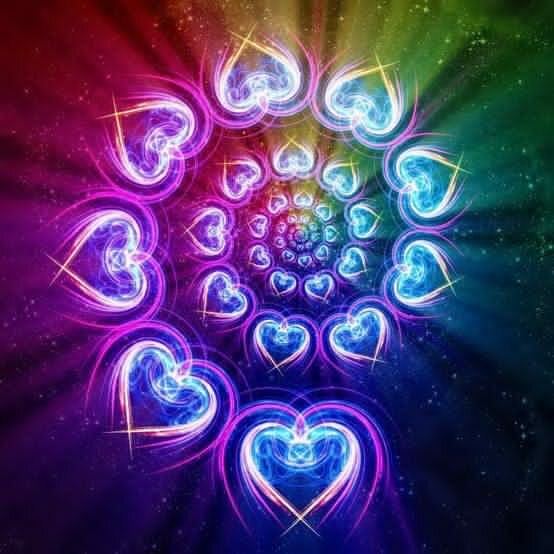 You will be led in quiet meditation and then guided into a self reflection of word and image. We'll end the day in contemplative group engagement. Others who have participated (even those having doubts about this process) have found collage meditation to be fun, surprisingly creative, and the personal insights garnered to be profound and sacred. Participants often report receiving further insight for weeks and months to come, as the wisdom drawn out from themselves and placed onto paper continues to be revealed. All supplies and a home cooked breakfast and lunch are included. Lisa Gammel Maas, spiritual director will be leading this retreat. Cost is $55.00; Call 859-527-0186 or email Lisa to reserve your spot. I loved this post! I love hearing the story of Patsy, a woman of self-awareness and creativity, passing her legacy on to others. It shows that courageous creativity and faith can make such a difference in the lives of others. I hope the retreat went well! The collage is beautiful. A really amazing story about your friend Patsy. To be honest, the final work looks totally incredible. I wish you success with your collage. Good luck!